Persistence Market Research analyzes the global pumps market over an eight year period from 2016 to 2024. The study demonstrates market dynamics and trends across regions that are expected to influence the current status and future prospects of the global pumps market over the forecast period (2016 – 2024). The primary objective of the report is to offer information on market drivers, restraints, trends, opportunities, and value chain analysis; and updates on developments in the global pumps market. The report conducts a quantitative as well as qualitative assessment of the global pumps market across pump types, sub-segments, pump capacity (HP), application, and regional market segments. The report studies the global pumps market under two vertical market segments namely Centrifugal Pumps market and Positive Displacement Pumps market. The report starts with a market overview and provides market definition and analysis of the drivers, restraints, opportunities, and key trends influencing the market. Impact analysis of key growth drivers based on the weighted average model is included to better equip clients with useful decision-making insights. The subsequent sections analyze the global pumps market and present a pricing analysis of the global pumps market by product type, segments, sub-segments, application, and region. For market data analysis, the report considers 2015 as the base year, with market numbers estimated for 2016 and a comprehensive forecast made for the period 2017–2024. The final section of the report presents a competitive landscape of the global pumps market to provide report audiences with a dashboard view of leading market players operating in the global pumps market, along with information on their market performance, SWOT analysis, and key business strategies. Some of the top market players featured in the report include KSB AG, Flowserve Corporation, Sulzer AG, Ebara Corporation, Grundfos, The Weir Group Plc., WILO SE, Xylem Inc., Ruhrpumpen Group, and Kirloskar Brothers Ltd.
To calculate the market size, the report considers the weighted average price of centrifugal and positive displacement pumps based on their capacities across geographies on a regional basis. The forecast assesses the total revenue as well as volume of the global pumps market. The data is triangulated on the basis of different verticals, considering both supply side and demand side drivers and other dynamics of the different regional pumps markets, along with primary interviews of manufacturers and industry experts active across the global pumps market value chain. The report begins by sizing up the current market, which forms the basis for forecasting how the market is anticipated to take shape during the forecast period. Given the ever-fluctuating nature of the global economy, the report presents forecasts not only in terms of CAGR, but also analyzes the global pumps market on the basis of key parameters such as Year-on-Year (Y-o-Y) growth to understand market predictability and to identify the right opportunities in the global pumps market. The report also analyzes the global pumps market segments in terms of Basis Point Share (BPS) to understand individual segments’ relative contribution to market growth. This detailed level of information is important to identify the many trends governing the global pumps market. Another key feature of this report is a comprehensive analysis of the global pumps market revenue forecast in terms of absolute dollar opportunity, critical in assessing the level of opportunity that a provider can look to achieve, as well as to identify potential resources from a sales perspective in the global pumps market. In order to understand key growth segments in terms of growth and performance of the global pumps market, Persistence Market Research has also developed a market attractiveness index to help providers identify real market opportunities in the global pumps market. Pumps are mechanical devices used for the transportation of liquid from one place to another by creating a suitable pressure head. Based on their working operations, pumps are basically classified into two categories namely centrifugal pumps and positive displacement pumps. Centrifugal pumps are used generally to transport liquid with large volume and substantial pressure head and are largely utilized for water, wastewater, and industrial liquid transportation in the power, steel, agriculture, and domestic sectors. Positive displacement pumps find their applications mainly in the industrial sector where consistency of fluid flow matters more as compared to the volume handled during the transportation. Global sales revenue from pumps deployment is estimated to account for US$ 34.39 Bn by the end of 2016 and is projected to reach a market value of US$ 49.40 Bn by 2024 end, registering a CAGR of 4.6% during the forecast period (2016–2024). The last decade has witnessed tremendous investment in infrastructure, sanitation, and water and wastewater management in the Middle East and Asian countries such as GCC countries, India, and China to support the growing rate of regional urbanization. The same trend is expected to continue over the forecast period, becoming a prime driver for sustained growth of the global pumps market, expectedly boosting demand for pumps across the globe. Increasing demand for electricity across the world is strengthening the global power sector; with pumps being an integral part of each power plant, development in the power sector is expected to contribute significantly to the growth of the global pumps market through 2024. However, low-priced offerings by Chinese pump manufacturers and low replacement rates due to durable life and energy efficient centrifugal pumps are factors that are likely to restrict the growth of the global pumps market over the forecast period. Rising demand for energy efficient centrifugal pumps and the adoption of micro disc pumping and variable frequency drive technology for centrifugal pumps are some of the key trends observed in the global pumps market. On the basis of product type, the Centrifugal Pumps market is segmented into Single-stage Pump, Multi-stage Pump, Axial & Mixed Flow Pump, Submersible Pump, and Sealless & Circular Pump. On the basis of product type, the Positive Displacement Pumps market is segmented into Reciprocating Pump and Rotary Pump. On capacity basis (HP), each pump segment type is further sub-segmented into Small Pump, Medium Pump, and High Pump. On the basis of application, the Centrifugal Pumps market is segmented into Agriculture & Irrigation, Domestic, Mining, Oil & Gas, Other Industrial, Wastewater Treatment (Effluent Treatment Plant, Sewage Treatment Plant), and Water Treatment (Industrial Process, Municipal & Commercial Facilities). On the basis of application, the Positive Displacement Pumps market is segmented into Chemical, Oil & Gas, Power, Pulp & Paper, Water & Wastewater Treatment, and Others. 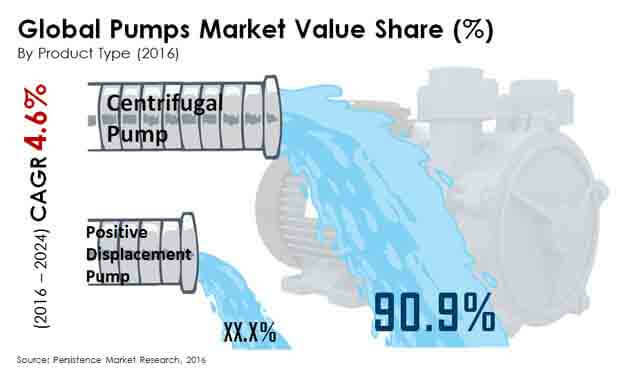 The Centrifugal Pumps segment is estimated to account for the largest market value share of 90.9% by the end of 2016 while the Positive Displacement Pumps segment is expected to account for around 8.8% share in terms of revenue by 2024 end. The Water Treatment application segment is expected to dominate the Centrifugal Pumps market with 23% share in terms of revenue and is expected to maintain its dominance through the forecast period. The Oil & Gas application segment is expected to dominate the Positive Displacement Pumps market with 23.6% revenue share by the end of 2016 and is expected to maintain its dominance through 2024. The global pumps market is segmented into the five key regions of North America, Latin America, Europe, APAC, and the Middle East & Africa (MEA). The APAC pumps market is estimated to be valued at US$ 13.25 Bn by the end of 2016 and is expected to increase to US$ 19.65 Bn by the end of 2024, registering a CAGR of 5.0% during the forecast period. Sales of pumps in MEA and Europe is estimated to collectively account for 7.2% share in 2016. KSB AG, Flowserve Corporation, Sulzer AG, Ebara Corporation, Grundfos, The Weir Group Plc., WILO SE, Xylem Inc., Ruhrpumpen Group, and Kirloskar Brothers Ltd. are some of the leading companies operating in the global pumps market. Top market companies are focusing on structured innovation and are expanding their production and research facilities to strengthen their presence in the global pumps market.